For the blues singer and songwriter, see Joe Medwick (blues musician). Joseph Michael Medwick (November 24, 1911 – March 21, 1975), nicknamed "Ducky", was an American Major League Baseball player. A left fielder for the St. Louis Cardinals during the "Gashouse Gang" era of the 1930s, he also played for the Brooklyn Dodgers (1940–1943, 1946), New York Giants (1943–1945), and Boston Braves (1945). In 1937, Medwick won the National League Triple Crown. Medwick was elected to the Baseball Hall of Fame by the Baseball Writers' Association of America in 1968, receiving 84.81% of the votes. In 2014 he became a member of the inaugural class of the St. Louis Cardinal Hall of Fame. The son of Hungarian immigrants, Medwick was born and raised in Carteret, New Jersey. He excelled in baseball, basketball, football and track at Carteret High School. University of Notre Dame football coach Knute Rockne made arrangements for Medwick to play football there, but Medwick decided to forgo college and enter professional baseball. Medwick entered professional baseball with the Scottdale Scotties of the Middle Atlantic League in 1930. In 75 games with the Scotties, he had a .419 batting average and 22 home runs. He spent most of the next two seasons with the Houston Buffaloes of the Texas League. He played 161 games for Houston in 1931, hitting .305 with 19 home runs. He played in 139 games for the team the next year, hitting .354 with 26 home runs before being called up to the major leagues. He made his debut with the Cardinals in 1932. By 1934, he hit .319 with 18 home runs and 106 runs batted in (RBI). Though Medwick swung at any pitch near the strike zone, he was difficult to strike out. He became known as one of baseball's rising stars, but it was also noted that Medwick had a self-centered nature. Medwick's hard-charging style of play got him pulled out of the seventh game of the 1934 World Series by Commissioner Kenesaw Mountain Landis. This occurred when Detroit Tigers fans started pelting him with garbage after he slid hard into third base on a triple. Landis also ordered Tigers third baseman Marv Owen, into whom Medwick had slid, benched. Medwick remains the only known player to be thrown out of a game for his own personal safety. When asked about the incident by reporters after the game, a perplexed Medwick said, "Well, I knew why [the Tiger fans] threw that garbage at me. What I don't understand is why they brought it to the park in the first place." Medwick won the National League Triple Crown and the NL Most Valuable Player in 1937, remaining the last NL player to win a Triple Crown. In one of the Triple Crown categories, home runs, Medwick finished the season tied with Mel Ott. On June 6 of that season, Medwick hit a home run that was later wiped out due to a forfeit, costing him the outright home run title. Medwick's 64 doubles in 1936 remains the National League record. He also holds the major league record for consecutive seasons with 40 or more doubles, set from 1933 through 1939. In 1940, the Cardinals traded Medwick and Curt Davis to the Dodgers for $125,000 and four lesser-known players. While still a solid hitter, Medwick never excelled defensively and the Cardinals felt that he was losing some of the skills he displayed in the 1937 Triple Crown season. Six days after the trade, Medwick was nearly killed by a beanball thrown at him by former Cardinal teammate Bob Bowman. Bowman blamed the incident on sign stealing by Dodgers coach Chuck Dressen. He said that Dressen would whistle each time he saw the sign for a curveball. Hearing the whistle, Medwick stepped toward what he thought was a curveball, but Bowman had decided to throw a high, inside fastball to confuse them instead. When Medwick strode forward, the ball hit him in the temple and he was rendered unconscious. Medwick helped lead the Dodgers to a pennant in 1941, but he had lost much of his dominance. He was traded to the New York Giants in 1943. During a USO tour by a number of players in 1944, Medwick was among several individuals given an audience by Pope Pius XII, who had been Cardinal Secretary of State before his elevation to the papacy. Upon being asked by the Pope what his vocation was, Medwick replied, "Your Holiness, I'm Joe Medwick. I, too, used to be a Cardinal." Late in his career, Medwick said that golf was helping him to stay in good physical condition; thirty-six holes per day allowed him to walk more than ten miles "without heavy strain". In 1946, he was signed as a free agent by the St. Louis Browns. However, after attending 1946 spring training with the Browns, he was not able to secure a spot on the regular-season roster and was seemingly out of baseball at age 34. 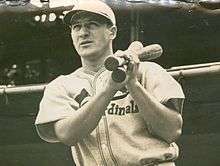 He eventually returned to St. Louis to finish his career with the Cardinals in 1947 and 1948. In 1949 at the age of 37 Medwick was player-coach of the Miami Beach Flamingos, a Class 'B' team in the Florida International League. He had 375 at-bats in 106 games, with 121 hits for a .323 batting average. He continued playing minor-league baseball through 1952 with Class 'B' Raleigh and Tampa, but his numbers declined substantially. Medwick retired with ten appearances in the Major League Baseball All-Star Game over seventeen seasons. He finished with a lifetime .324 batting average. In later years Medwick worked as a hitting coach in the Cardinals spring training camps and minor league system, his role with the team at the time of his death. Medwick had fallen short of the required Hall of Fame vote threshold on numerous ballots. In fact, he received no votes for the first seven years after his retirement, which is sometimes attributed to his strained relationship with teammates and the press. Medwick was elected to the Baseball Hall of Fame in 1968. After his election, Medwick said, "This was the longest slump of my career. I had gone 0 for 20 before, but never 0 for 20 years." Medwick died in 1975 of a heart attack in St. Petersburg, Florida. He was buried at St. Lucas Cemetery in Sunset Hills, Missouri, a suburb of St. Louis. Medwick was one of three players born in New Jersey to be elected to the Hall of Fame, and one of five to have attended school in the state—in each case, the only one from the central part of the state. At number 79, he was the highest-ranking New Jersey native to have made The Sporting News' list of Baseball's Greatest Players in 1999. That same year, he was nominated as a finalist for the Major League Baseball All-Century Team. He was elected New Jersey athlete of the century at century's end. In January 2014, the Cardinals announced Medwick among 22 former players and personnel to be inducted into the St. Louis Cardinals Hall of Fame Museum for the inaugural class of 2014. ↑ Staff. "Ducky Medwick, Slugger For Gas House Gang, Dies", The New York Times, March 22, 1975. Accessed October 19, 2014. "Medwick was born in Carteret, N. J,. on Nov. 24, 1911, and went on to star at Carteret High School in track, football, basketball, and baseball." ↑ Sperber, Murray (1993). Shake Down the Thunder: The Creation of Notre Dame Football. Indiana University Press. p. 299. ISBN 0253215684. ↑ "Joe Medwick Minor League Statistics & History". Baseball-Reference.com. Retrieved November 28, 2014. ↑ Alexander, Charles (2013). Breaking the Slump: Baseball in the Depression Era. Columbia University Press. p. 89. ISBN 0231504063. ↑ "Philly Bottle Barrage Caused '49 Forfeit". Daytona Beach Morning Journal. July 19, 1954. Retrieved October 31, 2013. ↑ Lowenfish, Lee (2009). Branch Rickey: Baseball's Ferocious Gentleman. University of Nebraska Press. p. 301. ISBN 0803224532. ↑ McKenna, Brian (2007). Early Exits: The Premature Endings of Baseball Careers. Scarecrow Press. p. 115. ISBN 0810858584. 1 2 Rice, Grantland (August 31, 1944). "Joe Medwick on the Rebound". The Miami News. Retrieved October 31, 2013. ↑ Corcoran, Dennis (2010). Induction Day at Cooperstown: A History of the Baseball Hall of Fame Ceremony. McFarland. p. 91. ISBN 0786444169. ↑ "Joe Medwick dies of heart attack". The Day. March 21, 1975. Retrieved February 8, 2014.